Yesterday the third graders went to the Manistee river Weir. We got to go in the building. We got to see a salmon heart and kidney. These things were really gross. We got to hold a salmon egg that was very hard. We held some alive eggs and some dead eggs. Alive eggs are orange and dead ones are white. I liked the weir. I know the salmon life cycle. This is the salmon life cycle: eggs, alevin, fry, fingerling, smolt, adult and spawner. A spawner is when the salmon lays its eggs. We went to the Manistee River on October 8, 2007. We watched them get eggs from the female. They are orange. I thought it was cool watching them get the eggs. The put milk in the eggs from the male. Our class got to see the fish pond. The salmon were jumping over the walls. The walls are so they don't get in the other pond. I thought that was cool too. On October 8 we went tot he Manistee River Weir. The first thing we saw was the inside of a salmon. They do that to see if they have a disease. Some people held the heart. The people took a needle and stuck it in the female salmon and the needle had air to push the eggs out of the salmon. And then they took and male and sprayed the milk or sperm on the eggs. On Oct. 8 the third graders went to the Manistee River Weir. When we got there the Biologist told us about what we are going to see. When we went inside I got to go to the table where people got to check out the salmon. They cut the salmon open. We got to see the hart. Lauryn, Kassidy and me got to hold the hart. It was gross but I still liked it. The hart was beating and I got to hold it. My hand got all bloody. Then I had to wash them. Next they showed us the female. They held it and then put a needle in it to help them get the eggs out. Then the male ferdilized it. When we got off the bus the bus driver moved the bus. All of us children, teacher and adults walked to the weir. When all of us people get up to the weir we stopped. The lady told us her name. The lady was a Biologist. The lady took us in the weir. She was talking in a mickrphone. We saw the people knock the salmon fish out. 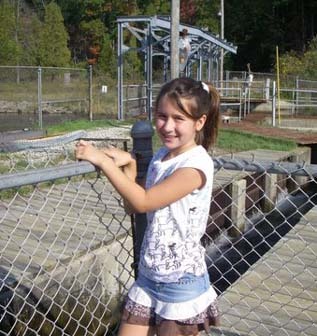 On October 8, 2007 the 3rd grade went to the weir. When we went in the weir they showed us the differents from a male salmon and a female salmon. 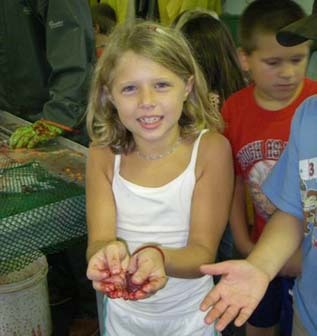 Then they showed us how they checked the salmon for disease and then they showed us how they got the eggs. We got to see a lot of stuff outside to. We got to see a fish ladder and then we got to see where they put all of the salmon. After that we went to a stream and relaxed. When we went to the Manistee River Weir I saw a fish heart. I also saw some people knocking out fish. I saw this too. They were squeezing out the eggs from the female and milk from the male. The fish ladder had a few fish jump it. I got splashed a couple times. A few fish got stuck because of the current. There were a bunch of eggs on the ground. Mrs. Catanese's class went to the Manistee River Weir for a field trip. I'll tell you the story about the weir. When we got there a girl told us what they do to the salmon. The girl took us in the weir and I'm telling you it was stinky. We saw all of the stuff in the fish. It was so gross it almost made me sick. We went in and we saw people with sticks in their hand. I thought they were like a cop hitting a fish. Me and our class went to the Manistee River Weir. We got salmon eggs. Some of the things that the people who work there did they exsplaned the stuff they were going to do. Some thing that they did to the fish was really cruol. It is they clobbered the fish right in the head. They did this so they won't flip out on them. The cool thing that they did is they got the egg in the body of the fish and the other cool thing is we got to hold the heart of the fish. They cut open the fish to see if it had a disease. But it was really gross that I did hold the heart. I almost fainted.